Usually people naturally create two paths on escalators. One is for standing, and the other is for walking. However, a research from the University of Greenwich in 2011 indicated that on average about 75% of people will stand on escalators while the other 25% walk, with this walkers creating more following distance on the walking side of the escalator versus the standing side. 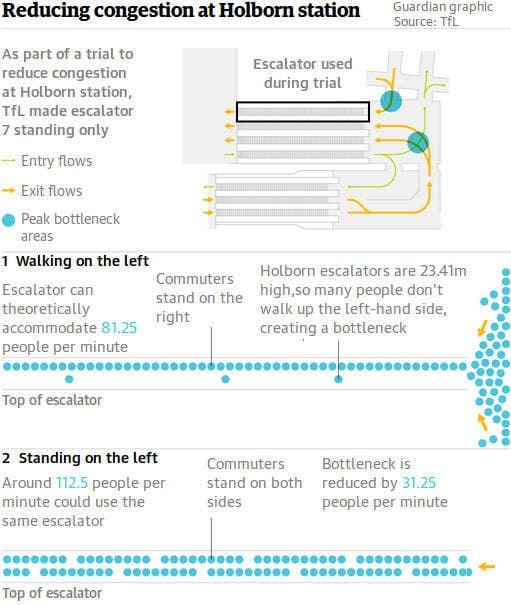 Transport for London's simulations preliminarily showed that using a whole Holborn Station escalator for standing would allow 31.25 more people per minute to board the escalator. This was based on an empirical evidence found out in Honk Kong's Mass Transit Railway (MTR). The evidence shows that while it can be two lines (walk - stand) in those stations where there is no commuter congestion (where commuters in a hurry could benefit from a dedicated walking lane), it would be required to optimise the use of escalators by setting the two lanes as standing lines at certain stations or times to benefit everyone.